The Twitter feed for Islamic extremist group al-Shabaab lit up on May 27 publishing photos of aircraft wreckage and extolling the virtues of the group's fighters who, after several hours of shooting, brought down an unmanned drone near the town of Buulo Mareer. The Pentagon's confirmation that it did lose the UAS, however, raises more questions than it answers. Like, why was the drone there in the first place? Somalia has seen far more than its fair share of bloodshed in recent years. After expunging Islamic extremist group al-Shabaab from the capital city Mogadishu in 2011, the group has conducted numerous suicide bombings. And while the passage of a new Provisional Constitution in August 2012 marks an important milestone in the country's reconstruction, the central government (with help from African Union forces) continue to battle with al-Shabaab forces south of the capitol. One of those areas is Buulo Mareer in the Lower Shabelle region, the site of a botched 2013 French special forces rescue as well as the site of the UAS crash. 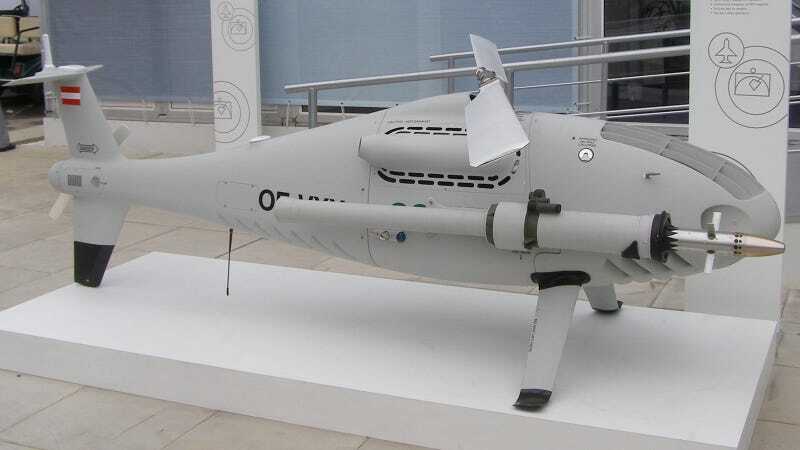 The downed UAS is a Camcopter S-100, produced by Austria's Schiebel company. Weighing just 440 pounds (200 kg) it measures 10 feet long with an 11 foot rotor diameter. Its 55 hp Austro AE50R Wankel rotary engine can run off of both gasoline and heavier fuels like JP-5 and JP-8, affording it a top speed of 138 mph and 6 hour endurance. What makes the S-100 interesting though is its payload. The CAMCOPTER ® S-100 was equipped with an American Technology Corporation loudspeaker capable of addressing crowds at a distance of up to 2 km, a leaflet drop capability, as well as an IAI POP300 EO/IR camera payload. [The system] was aimed at minimizing civilian unrest and preventing civilian casualties while apprehending a suspected terrorist cell. The S-100 was utilized to survey the area and provide real-time aerial intelligence, as well as to address the public and drop information leaflets. The Pentagon stated that the craft was on a routine reconnaissance flight, however, Abdikadir Mohamed Nur, governor of Lower Shabelle, told Reuters that militants spent hours shooting at the S-100. "Finally they hit it and the drone crashed," he said. There's no word yet on whether it was shooting back at the insurgents at the time of impact.